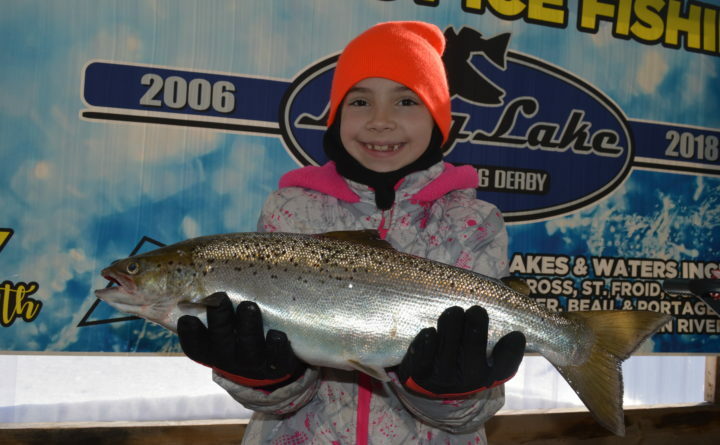 Emma Kelly shows off the landlocked salmon she caught to win the youth category at the 13th Long Lake Ice Fishing Derby in this file photo. Kelly's fish, a true Long Lake "football," weighed 4 pounds, 15.8 ounces. If you’re interested in winning some big cash and doing a bit of ice fishing this weekend, you may want to head north, where organizers of the 14th annual Long Lake Ice Fishing Derby are making final preparations for this year’s event. But do yourself a favor. Make sure you have a snowmobile at your disposal. You’ll need it to get out onto the 10 waters that are open to derby participants. That means that northern lakes and ponds are covered with drifting snow on top of abundant ice. Organizers bill the Long Lake derby as the state’s largest ice fishing derby, and the cash prizes seem to support that claim. Among the cash prizes: $1,500 to the adult anglers who catch the biggest landlocked salmon and togue, and $1,000 to the adult entrants with the biggest brook trout and muskellunge, as well as second-place finishers in the salmon and togue categories. In all, $18,500 in cash is up for grabs, and derby organizers have gathered a pile of door prizes that will also be handed out. One lucky angler who bought a two-day registration will walk away with a Sport Shack ice fishing cabin worth $4,000. Last year a record 1,103 people bought derby registrations. That doesn’t necessarily mean that all registrants actually fished — some enter in order to become eligible to win prizes — but it does reflect the popularity of the event. Registration fees: $15 for one day or $25 for the weekend for anglers age 14 and older, and $5 per day for anglers 13 and younger. The base camp and weigh station for all species of fish except muskellunge is Long Lake Sporting Club in Sinclair. Muskies may not be taken to that location and can only be weighed at Joe’s Country Store in St. Francis. The waters open for fishing during this year’s derby: Long Lake, Square Lake, Cross Lake, Eagle Lake, St. Froid Lake, Beau Lake, Glazier Lake, Portage Lake, Carr Pond and the St. John River. — The largest winning landlocked salmon weighed 7 pounds, 14.2 ounces. — The largest winning lake trout weighed 15 pounds, 4.4 ounces. — The largest brook trout was 3 pounds, 14 ounces. — The top muskellunge weighed 20 pounds, 4 ounces. — The biggest cusk was 12 pounds, 2.8 ounces. — During the first 13 years of the derby, a total of $64,500 was donated to the Edgar J. Paradis Cancer Fund. Anglers are invited to the opening ceremony, which will run from 7 to 11 p.m. Friday at the Lakeview Restaurant in St. Agatha. A band will be on hand, and derby officials will hand out $2,000 in door prizes.